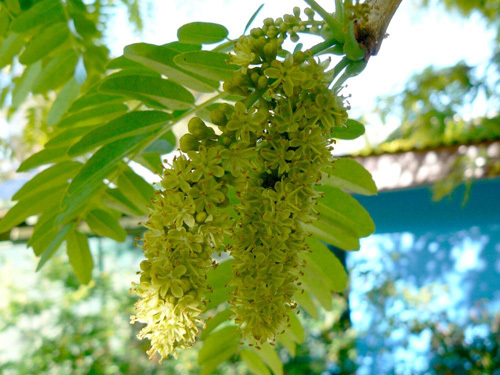 This central North American native is a common ornamental shade tree in the suburbs of America. But here on the Coffs Coast this is listed in the Coffs Harbour Regional Landcare's 'Weeds of the North Coast of NSW'. 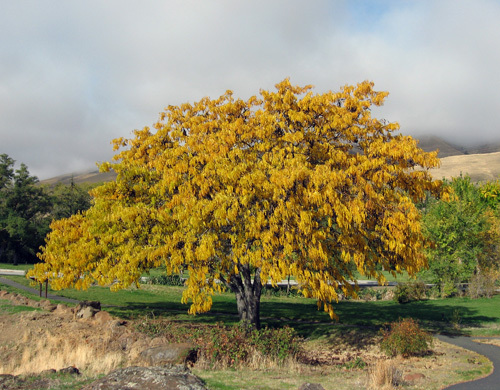 There is a Gleditsia triacanthos var. inermis 'Elegantissima' available in nurseries throughout Australia which is a small, slow growing compact form of Gleditsia that is recommended as a screening tree in gardens, courtyards, carparks and streets. Perhaps this variety is not nasty as the one listed in the Weeds book, which is the one that will be discussed in this post. 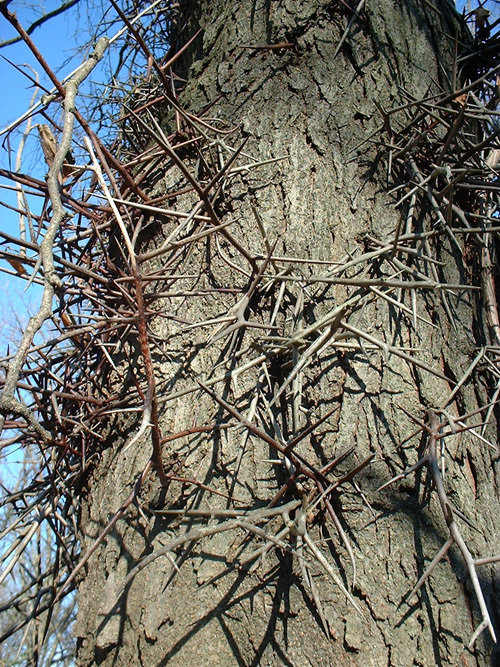 The Honey Locust is a spreading, deciduous, medium to large tree, which can grow 15-25m tall bearing clusters of large thorns, 2-10cm long. 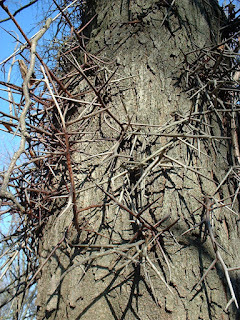 The trunk and limbs of 'wild' trees bear very large crucifix-like spines that can grown to more than 50 mm. This is one tree that possums won't be scurrying up! The root system is capable of suckering and coppicing when disturbed. 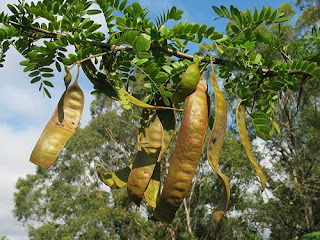 The leaves are compound, 15-20cm long, usually bipinnate (twice divided); leaflets are elliptic to ovate, 10-35mm long, 5-12mm wide and sparsely toothed. The flowers are fragrant, brownish-yellow pea-like flowers in spring as leaves develop or after leaves appear. The fruit of Gleditsia are pods which are slightly sickle-shaped, 15-40 cm long, 3-4cm wide and dark brown. They do not open at maturity and contain 15-25 hard brown seeds. Apparently the pods are relished by livestock and in America they are grown expressly for that purpose. Dispersal of this plant is usually by flood waters, animal dung and garden waste dumping. Small plants can be pulled by hand. For larger plants or trees the cut and paint or stem injection method with 100% glyphosate is recommended.